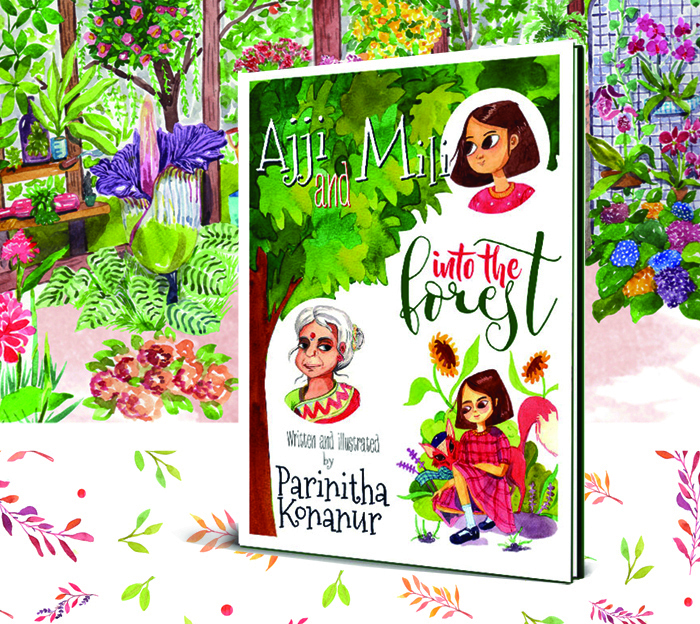 Ajji and Mili – Is a Children’s Book Series the first of which is Ajji and Mili – Into the Forest. It is an endeavor not only to create an engaging and entertaining book with watercolour illustrations for children, but also as a way of introducing nature to children through stories. It is a way of introducing children to flaura and fauna, environmental topics through engaging stories with a tad bit of magic in the mix. It is a story of adventure and camaraderie, of compassion and friendship. The reason I started writing Ajji and Mili was because I grew up listening to my Grandmothers stories, one story led to another and another. Ajji means Grandmother in my Mother tongue Kannada. I always loved nature but got more involved with environmental issues about 5 years ago and came to realize that the best way to conserve nature is to have the next generation be more aware and prone to conservation. For this to happen children need to be made aware. This book tries to do that with stories and with adventure, with magic and fun. This way children can find it entertaining and engaging as well as find a way of connecting to nature through stories and images. This campaign will help me bring this book to reality along with working on colouring books and other activity books with nature as the main theme and fun characters. I decided on self publishing for many reasons, I wanted to be the one to write it and also illustrate it. Having had experience in both writing and illustrating along with designing experience for half a decade I am quite confident on putting the best foot forward. The amount needed to bring this to life is 11,000 USD. This will help in the editing, proof reading and printing of the book. It will also aid in the creation of the colouring book and activity books that are to follow. It will aid in getting a GST Number for all tax purposes. There are loads of perks to choose from -Archival quality Art Prints of my original Watercolour illustrations, Stickers , Badges and Bookmarks with watercolour illustrations, Colouring book, Slipcase Gift Edition with Autographed books with spot laminated hardback covers. The most of the funds 70% will go into the printing of the books with high quality papers inside and spot laminated hardbacks for the special edition. 10% will go into packing and shipping costs. The rest of the fund will be distributed between the Indiegogo fees, proof reading and editing costs, production of stickers , bookmarks and badges. The most important hurdle to cross will be to get everything printed on time and packed and shipped to people. If there are any issues with the book or any of the perks you receive please feel free to notify me immediately and I will do everything I can to replace the damaged product immediately. If you cant contribute right away but liked my work please subscribe to my website and help spread the word. Do use the Indiegogo share tools!